This article is about the Falmer language. For the race, see Snow Elf. For the creatures, see Falmer. The Falmer Alphabet is, or rather was, the alphabet used by the Snow Elves. It is a very stylized script, quite the opposite of the minimalist script of their Dwemer captors. There are only two known examples of the language, both appearing in Skyrim. The very low number of examples is probably due to the fact that the many Snow Elves who sought asylum with the Dwemer were forced to lose their sight, at which point they ceased to require a written language. Gallus's Encoded Journal, written by a former Guild Master of the Thieves Guild, is written in the Falmer alphabet, but it directly transliterates into English. The Skyrim add-on Dawnguard adds an additional four books, Unknown Book, Vols. I, II, III, and IV, but they too directly transliterate into English. 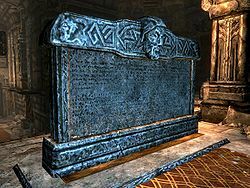 A stone which translates both Dwemeris and the Falmer language. No translation to this is provided, but parts of it can be translated, as detailed below. Note: The partial translation below is just expert opinion. The Falmer language appears to be heavily based on the Ayleid language. A large number of words are shared by both languages and it appears that the Falmer language also uses the same grammatical structure. Details on the Ayleid grammatical structure can be found here. One difference is the complete lack of punctuation and capitalization, making separating sentences and clauses very difficult. Punctuation has been inferred from the Dwemer version of the text. And your people driven CALNE pass into our Halls of Fire, and TRUMBI our power. of SERCEN, and GETHENA your final journey VEY guiding your eternal BISIA. Below is a list of known Falmer words, gleaned from the official translation of Calcelmo's Stone. Definitions are provided when known. Because of the large number of compound words in the Falmer language, many words in the list will have similar parts. This font was created by GodRaine and is available for download. Note that all of the Falmer letters are written in entirely upper-case. For Windows: Unzip and copy the FalmerFont.ttf file into the WINDOWS\FONTS (95, 98/ME, XP, Vista and 7) or WINNT\FONTS (NT, 2000) directory. For Mac: Unzip (Stuffit Expander should work), and copy the FalmerFont.TTF file into your /Library/Fonts folder. For Linux: Open the TTF file and click on "Install Font". The usage on the wiki is described in more detail on its template. This page was last modified on 8 December 2018, at 19:55.